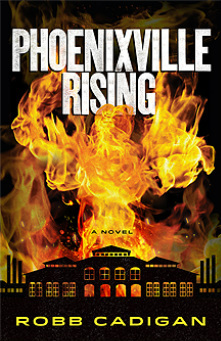 UPDATE: PHOENIXVILLE RISING is available from Amazon. Click here. We are thrilled to hear that Robb Cadigan‘s first novel is being published by Rodgers Forge Press in October, 2013. PHOENIXVILLE RISING is “a tale if rebirth and redemption, as rich and vibrant as the American town it portrays.” Robb has received advance praise for the novel from NYT best selling author William Lashner. See what Lashner says by clicking through to Robb’s website, and sign up for a chance to receive a free copy by joining the email list. Robb’s short story, Baptism, was featured in Chester County Fiction, an anthology of Chester County writers that was published by Oermead Press. Robb lives in Phoenixville, PA.